The Galaxy S10 marks the first time in a long time where choosing the smaller Galaxy S flagship won’t result in losing significant camera capabilities. Both the Galaxy S10 and Galaxy S10+ ship with a triple camera system around back, which also marks the first generation Samsung is using an ultra-wide angle camera on its phones. This ultra-wide angle camera is the biggest change coming from the Galaxy Note 9, as the standard and telephoto camera are otherwise identical to what we saw on Samsung’s best 2018 flagship. To see every picture comparison we have for the Galaxy S10, head on over to the gallery on Flickr. It’s the ultra-wide angle lens that represents the most exciting new addition to Samsung’s lineup and joins ranks with LG and Huawei in having such abilities. Samsung chose a wider angle than everyone else by several degrees, coming in at 123-degrees, making this the absolute widest angle smartphone camera on the market. Simply put, that means you’ll see more of the whole scene at once, but it also means there’s going to be a tad bit of distortion due to having a fisheye lens. During the day you’ll notice that the Galaxy S10's ultra-wide angle camera produces images with wider dynamic range than both the Huawei Mate 20 Pro and the LG V40 ThinQ. During these brighter conditions, the Galaxy S10’s ultra-wide angle camera is the best you’ll find. 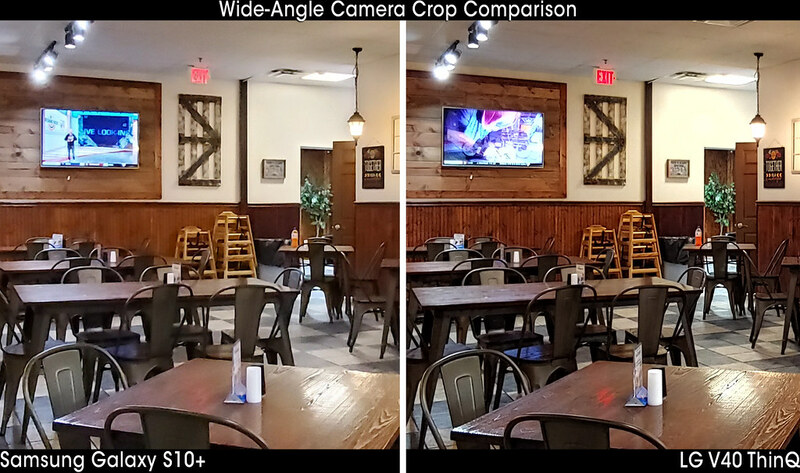 In any kind of lower lighting, however, the performance significantly degrades when compared to the other two major phones with an ultra-wide angle lens. The pixel size on this 16-megapixel camera is quite a bit smaller than what’s on the main 12-megapixel camera and, as a result, noise elevates significantly in lower lighting. Oddly enough, Samsung appears to be using a different type of processing for the ultra-wide angle camera in low light than it does with the main camera. On the main camera, lower lighting typically allows a bit more noise into the shot to preserve detail, but this doesn’t appear to be the case on the ultra-wide angle one. The result is something more akin to muddy than clear. Dynamic range is still pretty wide and the shots are plenty bright, but fine detail gets lost very quickly, and even in a well-lit restaurant just looks soft and cheap. Whether or not you’d ever zoom into a photo enough to see this result may be another conversation entirely, so this issue may be less relevant than if it happened on the other two cameras. As we saw on the Galaxy Note 9, the 12-megapixel main rear camera is an incredibly solid performer in any lighting condition. The two biggest negatives come in the form of color reproduction and fine detail. Colors tend to be a tad on the warm side, which isn’t offensive by any means, but it’s not color accurate either. Fine detail can sometimes be lacking, as has been the case for a significant number of generations now, but Samsung has improved this over the past 2 years in particular. Samsung’s processing tends to over-scrub noise out of a scene which results in reduced fine detail on objects. This is more apparent when a scene requires extra HDR processing and is similar to what LG does on the V40. This loss of fine detail is more apparent on the telephoto camera, which shows less detail than other telephoto cameras out there in many situations. 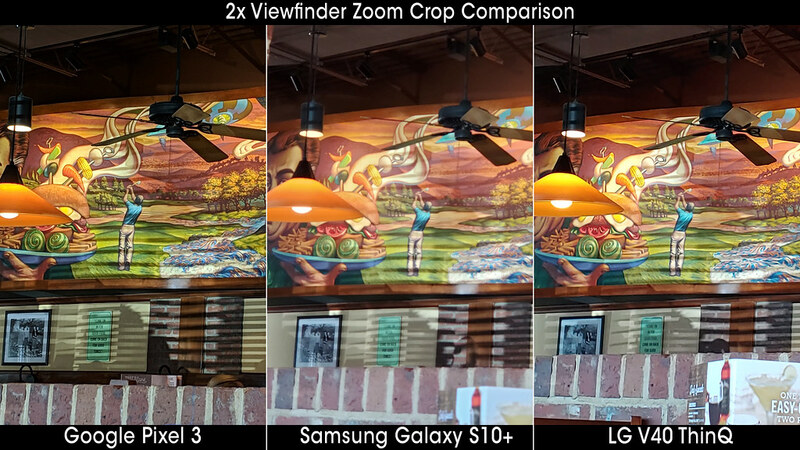 Even the Pixel 3 often beats the Galaxy S10’s telephoto camera in sheer detail, which obviously should not happen given that the Pixel 3 only uses a single camera system with the same megapixel count as the Galaxy S10’s main camera, yet it’s clear Google’s software tricks do a better job of producing a nicer zoomed in image than Samsung’s dedicated hardware solution in some lighting conditions. 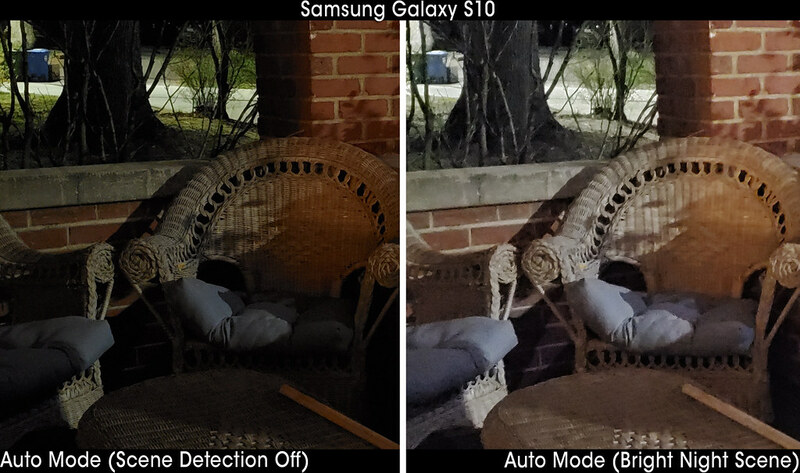 All three cameras do an exemplary job at capturing motion though, even in lower lighting conditions, and this is where Samsung seems to have made the single biggest improvement over previous generations. When compared to the Pixel 3 there’s seemingly no contest; Samsung’s Galaxy S10 takes clearer, less blurry pictures than Google’s latest flagship in every lighting condition we tested movement in. Folks with kids will particularly appreciate this, as I had no issue taking pictures of my 5-year-old son in any lighting condition with the Galaxy S10, and it frequently was either the best or tied with the best performers in all of these cases. That ultra-fast dual-pixel focusing system is really paying off here, and the f/1.5 dual-aperture helps lower shutter speeds in these types of lighting conditions on that main camera, resulting in sharper imagery. Moving onto low light shots with less movement, you’ll find that the Galaxy S10’s camera performs essentially identically to the Galaxy Note 9. It excels at providing a super balanced image that has lots of detail, good dynamic range and prioritizes light sources being blown out. Shots end up being slightly darker than the Mate 20 Pro, but considerably brighter than the Pixel 3 in auto mode in most cases. As we’ve seen in the past, Samsung is not afraid to let a little noise into lower light shots to keep them from looking muddy, and these shots tend to look crisper than photos taken in bright light with the Galaxy S10. In auto mode, the Galaxy S10 tends to trade blows with the V40 in many moderately low light shots. Very low light shots are probably the biggest disappointment with the camera, as Samsung still doesn’t have a proper night mode. Most of the time you’ll find that taking low light shots uses the standard auto mode, even with scene detection enabled, and there’s no way to force what’s called Bright Night mode. Rather, you have to hope that the automatic scene detection switches to this new mode when it’s needed most. Even then you may find that auto mode just turns out a better picture, even if it’s a darker one. Bright Night isn't nearly as effective at its task when compared to other night modes, especially Google's Night Sight or Huawei's night mode. As a result, there was almost never a situation where Bright Night picture looked visually preferable to a shot taken without this functionality enabled. Bright Night mode's problems are two-fold, and they’re entirely situationally dependent. Some scenes don’t appear much brighter than when just using auto mode, if at all, and even when they are brighter the loss in detail is almost never worth it. Quality is mostly neck-and-neck with LG’s auto night mode, which a similar idea on the surface, but achieves the goal very differently on both the back-end and user-facing end. LG’s method uses pixel binning to take photos nearly instantly, while Samsung’s method asks you to hold the phone still for a few seconds while it captures several photographs and stitches them together. Given the time difference and the lack of any substantial quality difference in most shots, LG’s method seems to work better for this style of auto night mode. Oftentimes, keeping scene detection off resulted in a nicer picture and the quality performance was more predictable with this setting turned off. Speaking of predictable, Samsung has added a few cool new features to the camera software this time around. Utilizing that new generation neural processing unit (NPU) inside the Snapdragon 855, Samsung has designed a way for the NPU to analyze the viewfinder in real time and come up with suggestions for each shot. Sometimes this simply tells you to slightly adjust the angle you’re looking at to better frame a subject, while other times it might tell you to switch to one of the other two cameras instead, either zooming in with the telephoto camera to focus more on a single point, or using the ultra-wide angle camera to take in the whole scene. My biggest complaint with the software is the continued use of the carousel design that's completely taken over the industry. Samsung started the iPhoneification of its software on the Galaxy S9 and now has very little differentiation between it and Apple’s design language. Much of this is Google’s fault, as Samsung is just following what Google is doing, and it shows in the user experience overall. Up until the Galaxy Note 9, Samsung users were able to record a video or take a picture without ever having to switch a mode. Now you have to swipe and wait just to do either of these things, and the same goes with switching to any of the other modes on the camera. Other than being exactly like an iPhone, there's almost no reason for a manufacturer to switch to this type of interface. It’s slower, clunkier, doesn’t show all available modes in a single pane of glass, and is far too easy to accidentally swipe anywhere on the screen and change the mode or swap cameras. Pro mode is at least excellent, despite still not having pro controls for video recording. Shutter speed adjustments up to 10 seconds in length are great, but you can still only select up to 800 ISO. Samsung's apparent fear of allowing high ISO on its cameras is a bit perplexing, especially given that manufacturers like Sony and Huawei regularly push the boundaries of how high ISO can go. Manual focus features focus peaking, a way to see what the camera is focusing on by way of green highlights around objects in focus. This means that manual focus is actually usable on the Galaxy S10, joining the ranks of the LG V-series, among a scant few others. Many phones forget steps like this, which assist users in getting the shot focused without professional tools. Samsung has added in a ton of new advanced video modes with the Galaxy S10, but there’s a bit of a caveat to all of them; they only work on the main rear camera, not the ultra-wide angle or telephoto cameras. That includes the new 4K HDR video feature and the new super stable video mode, as well as 4K 60FPS recording. 4K HDR isn’t too much of a loss though as, quite frankly, HDR recording on a phone is pretty useless at this point in time. We took several videos using the HDR setting but have walked away with the opinion that it's simply not a feature that will provide value for the vast majority of people, and even the ones that might find it useful will likely find the tools provided are a bit lacking. For instance, one of the HDR videos was rotated incorrectly from the get-go, which would normally be a non-issue since you can normally rotate video right in the photo gallery. The gallery doesn't support rotating or editing HDR video of any kind, unfortunately, so it's impossible to edit this footage on the phone. Try importing it into any popular video editor, even professional tools like Adobe Premiere, and you'll find it's not easy to edit it in those programs either without running into issues. The bottom line is that HDR video is still something meant for professionals, and the tools Samsung provides here don't help that image in any way. Thankfully, image stabilization is quite excellent, as is overall exposure. You’ll find that in 4K the Galaxy S10 does a better job of nailing the exposure than the Pixel 3 in our sample videos, and is equally as smooth as the best phones on the market during movements like walking. Samsung has added a new Super Stable mode that only works up to 1080p resolution, but can be easily toggled via single button press on the top of the viewfinder. This essentially toggles between the default set resolution and 1080p and provides an easy one-button-press way to add additional stabilization to the mix when needed. Advanced stabilization is not available for use with the ultra-wide angle or telephoto cameras. Likewise, limiting 4K60FPS video to the main camera is quite a missed opportunity, especially since the LG V40 ThinQ has no problem using both the ultra-wide angle and telephoto cameras at that resolution and frame rate. Thankfully at 4K30 the Galaxy S10 does a great job of providing a more delay-free way of switching between all available cameras, while the V40 has a noticeable pause when swapping between all three. Hardware reasons aside, the user experience is far smoother on the Galaxy S10, whether it’s simply pressing the buttons on the interface to toggle between all three cameras, or just dragging the slider to dynamically swap between them. Low light brings a rather large dichotomy between the standard and ultra-wide angle cameras, which is to be expected given the pixel size difference between the sensors but is unfortunate nonetheless. That f/2.4 lens is also unable to bring in as much light as the main camera’s lens, and with these two combined factors, you’re inevitably going to have a darker video when using the ultra-wide angle camera. The ultra-wide angle camera records smoother, brighter and more detailed video than what the Huawei Mate 20 Pro can do, but the LG V40 ThinQ does a better job with its ultra-wide angle camera than both of those phones. In our video review, we ran an audio test recording a live performance at a brewery on St. Patrick's Day. Results of this test conclude that the Galaxy S10's audio recording performance is good, but not the best. Audio is very center-weighted and sounds a tad flat, but Samsung does a good job of leveling volume automatically without obvious volume adjustment after-effects. This keeps distortion down, especially when recording loud environments like that. Lastly, we’ll take a look at the front-facing camera. This is the area where Samsung made one of its biggest improvements on the Galaxy Note 9, and the Galaxy S10 continues that improvement. The Galaxy S10 is safely in the top of the top best front-facing cameras, especially when considering the secondary 8MP camera on the Galaxy S10+, which is used exclusively to capture better depth information in portrait mode. The Pixel 3 still delivers pictures that look more punchy, but tend to look overly harsh in conditions with lots of contrast like a bright, sunny day. The Pixel 3’s pictures tend to look hyper-real instead of real, while the Galaxy S10 just looks nicer, with more realistic colors and skin tones. We did not use beauty mode in our comparison tests for any of the phones to give you an idea of the least processed output. The Galaxy S10+’s new depth camera on the front does an excellent job at front-facing portrait mode, which is a massive improvement over all previous Samsung phones, as those really just did a terrible job at object detection in this mode. You’ll see worse edge detection on the standard S10, unfortunately. Both phones are able to record up to 4K quality on that front-facing camera, which is a step up from the previous generation and adds a level of crispness not found on other phones. Low light is awash between most phones we’ve tested and doesn’t show all that much difference in quality performance between any of these four. The Galaxy S10 has an odd wide-angle setting on the front camera, but the standard view is really just a crop of the wide-angle one, making it a bit of a strange option to provide. At the end of the day, the Galaxy S10 family provides a very positive camera experience. This is particularly interesting because it’s the best in very few situations, but it’s also almost never the worst, either. It’s sort of a happy middle ground in all areas with particular strong suits in a few. Quality restrictions in the video mode hurt it when compared to the LG V40, and a lack of a real night mode puts it behind many other phones that have launched with such a feature. If those aren’t deal breakers for you, however, it’s likely the Galaxy S10 will provide the most well-balanced experience of any phone on the market, especially if you have children or pets to take pictures of.